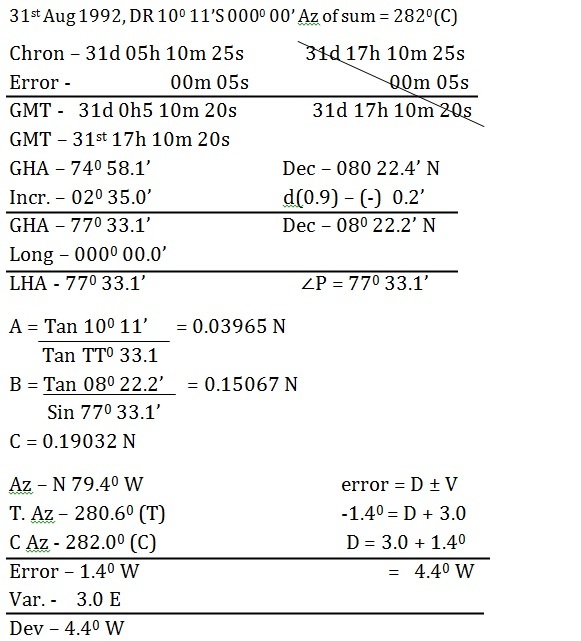 On 29th Nov 1992, AM at ship in DR 260 27’N 1300 27’W, the azimuth of the Sun was 1300(C) when chron showed 05h 49m 20s. 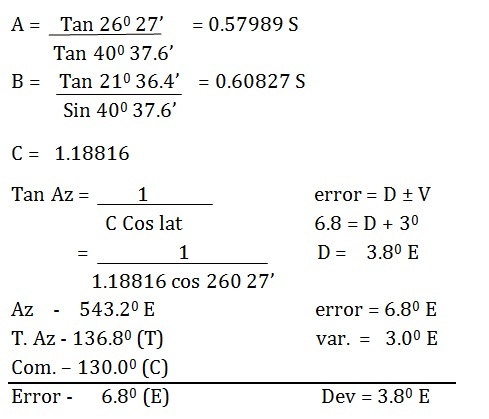 If chron error was 01m 31s fast and variation was 30E, find the deviation for the ship’s head. 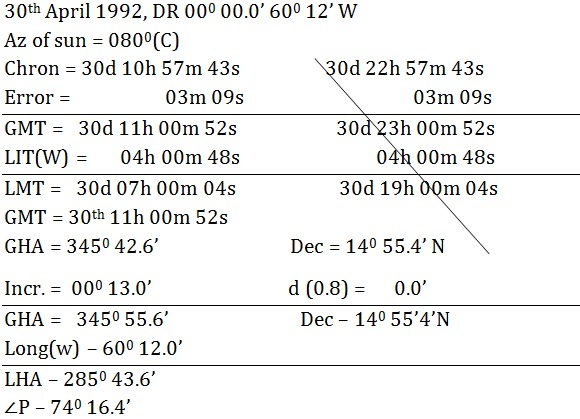 On 22nd Sept 1992, PM at ship in DR 180 20’N 850 40’E, the azimuth of the Sun was 2650(C) when chron showed 10h 03m 20s. 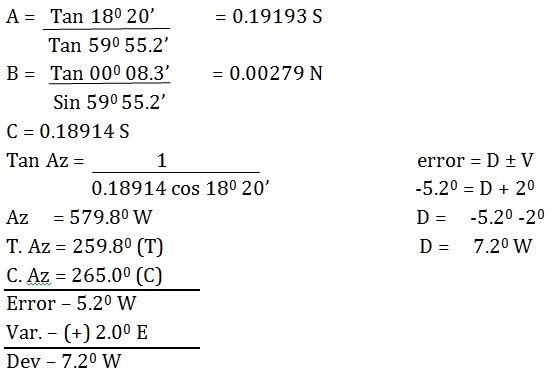 If chron error was 06m 18s slow and variation was 20E, calculate the deviation of the compass. 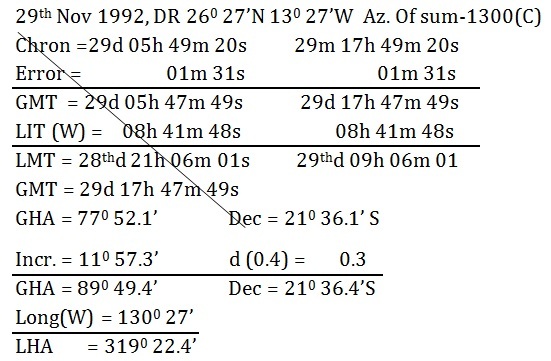 On Jan 19th 1992, in DR 400 16’S 1750 31’E, the azimuth of the Sun was 2670(C) at 1618 ship’s time. 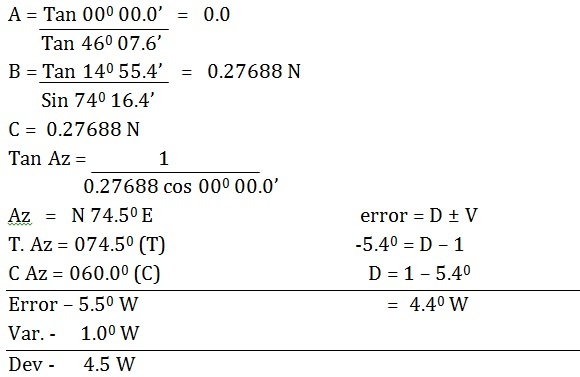 If the ship’s time difference was 11h 30m from GMT and variation was 2.30E, find the deviation for the ship’s head. On 30th April 1992, in DR 0000’ 600 12’W, the Sun bore 0800(C) when chron showed 10h 57m 43s. 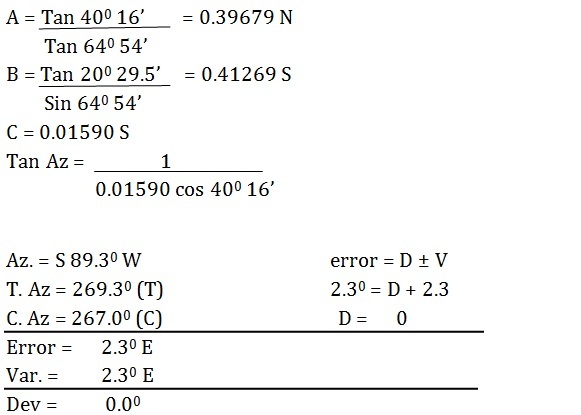 If chron error was 03m 09s slow and variation was 10W, find the deviation of the compass. 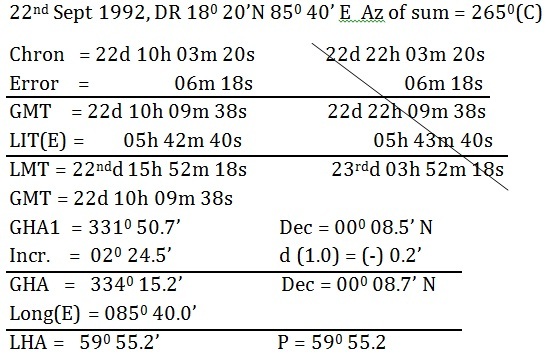 On 31st Aug 1992, in DR 100 11’S 0000 00’, the azimuth of the Sun was 2820(C) when chron showed 05h 10m 25s. If chron error was 00m 05s fast and variation was 30E, find the deviation for the ship’s head.